Another great day dodging the rain fishing for blue catfish on Grand Lake in Oklahoma! Larry, Iris and Alyssa, it was a pleasure as always to have you on another guided fishing trip. 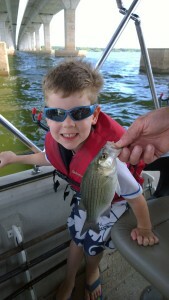 We had to delay our start a couple of hours, but that didn’t matter because the fish bit all day long. The temperature was really nice for August in Oklahoma (high of 82 I believe). We all wore jackets most of the morning. 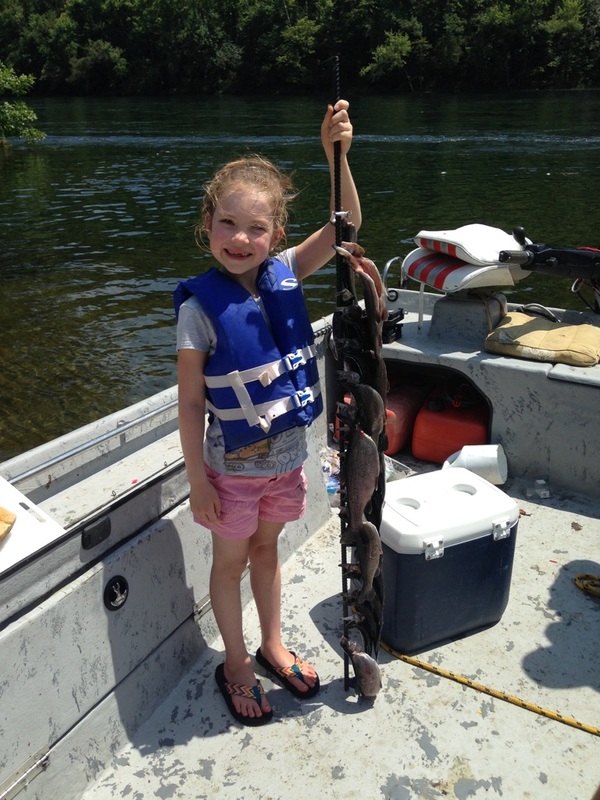 We managed to catch all three species of catfish two days in a row, blue catfish, channel catfish, and flathead catfish! Large gizzard shad dragging at .6-.8mph was the key in 22-38ft of water. If you don’t have a trolling motor to drag with, you can kick the boat sideways to the wind and control your speed with drift socks. I use about 3 ounces of weight most of the time when fishing on Grand Lake. If you’d like to book a guided fishing trip on Grand Lake or another lake in Oklahoma give me a call. Grand Lake in Oklahoma was nice today providing some kids their first blue, channel, and flathead catfish!!! They filled the cooler for a family dinner. Thank you Iris for bringing your fun family from San Francisco. We caught blues, channels and a flathead dragging fresh shad in 20-35ft of water. Dragging at .6-.8mph was the sweet spot. We put the top up for about an hour to fish in comfort while it rained all around Grand Lake. Great group to spend the morning with! 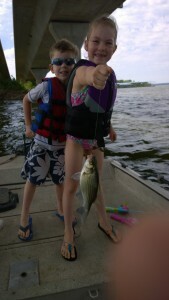 We decided to take the kids to Grand Lake to fish for White Bass (Sand Bass) this evening up the Elk River. We caught fish in 4-20ft of water as the white bass worked bait and trapped them on the ledge and point. They blew up on top for about ten minutes, but most were caught on slabs on or near the bottom. 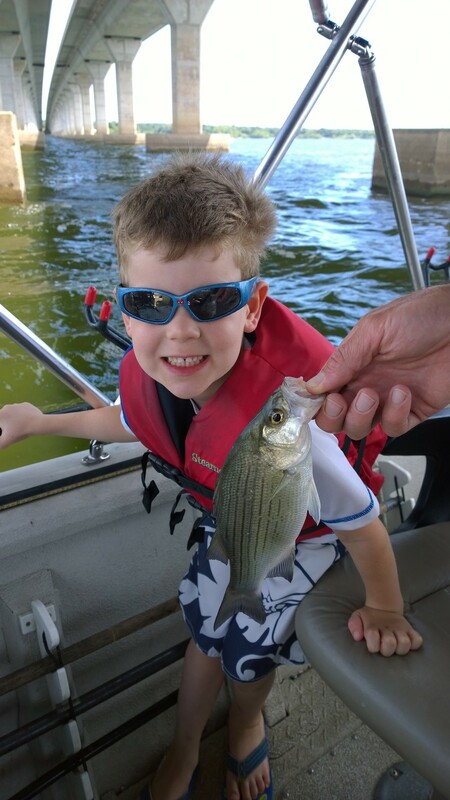 My son threw a tailspinner and caught his first white bass all on his own. Talk about a super excited 5 year old! It was an exciting moment that I will cherish. They grow up way too fast! 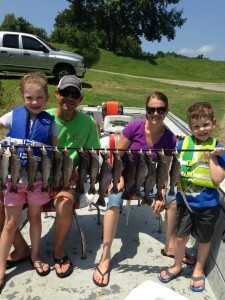 Such a fun mini vacation to Bull Shoals, Arkansas fishing for rainbow trout. Ralph with http://www.whiteriverfamilyfishing.com/ put us on the fish from start to finish and was awesome with the kids! I highly recommend his guide service fishing the White River below Bull Shoals. 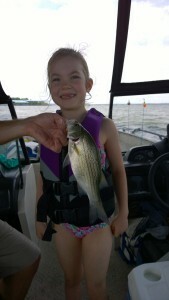 We caught white bass in 12-21ft of water on Bendable Minnows and Ole Ugly slabs with flies tied above them. Even found a few under a bridge in the shade. Lots of spoonbill paddlefish were doing their summertime cannonballs. The kids sure do think their fun to watch making big splashes. It gets me excited for snagging spoonbill paddlefish. I’m ready for December-May and drags to be screaming!!!! 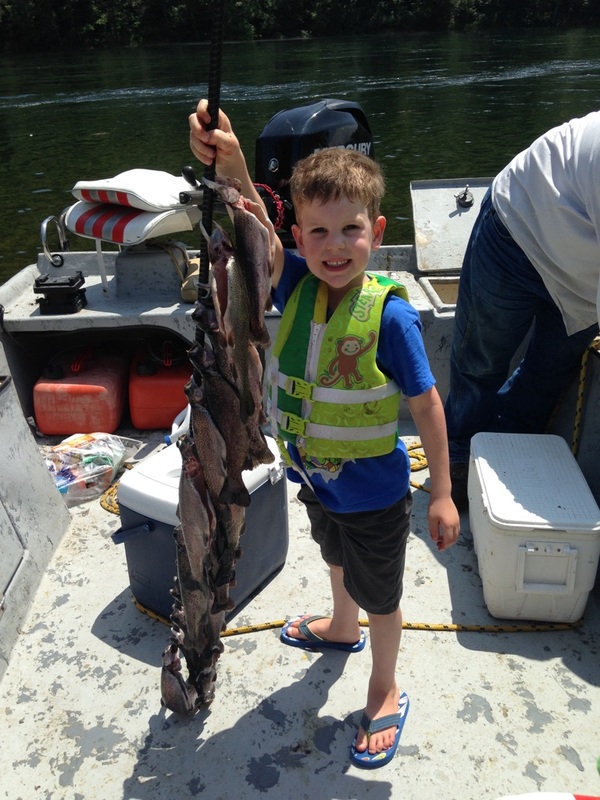 Today, first time guests, Colton Tisdale and his father joined me for a catfish trip on Grand Lake. 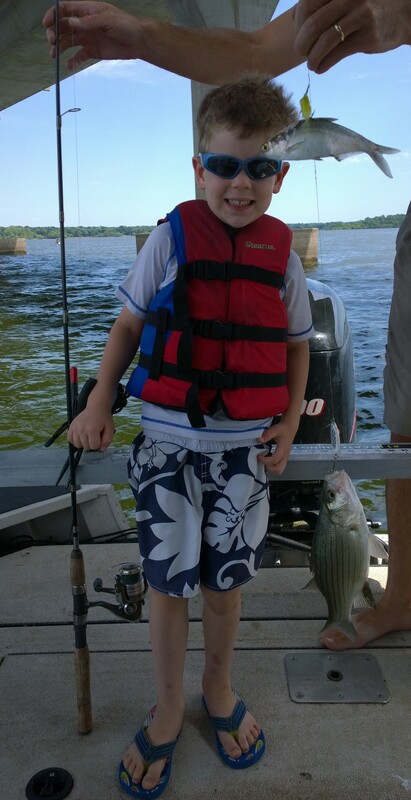 We started out shallow on anchor and put a couple solid blue catfish in the boat the first minute out there. Then the gar moved in and the bite stopped. We tried dragging a ledge close by and couldn’t get away from the bait stealing gar. Made a run to a flat and got a couple of smaller blues. We decided to make a long run to a different area of the lake. Put the top up and went to dragging. The bite became consistent at the 12-24 depth. They caught the catfish trifecta, blue, channel and a nice flathead. It was a really fun morning on the boat with these two. Cleaned a cooler full for a family dinner.